So, you’ve got your foot in the door and landed that coveted interview. While it's easy to get caught up in the stress of the big day itself, the key to giving yourself the best shot at success lies in doing all of the hard work in the lead-up. The way that you prepare for a job interview is critically important and can make the difference between an average interview and a fantastic one. Below, we’ve used our expert knowledge and experience in the IT recruitment industry to guide you through a few of the most common interview preparation mistakes we see candidates make, so that you don’t fall into the same trap. Knowing how to research is arguably the most important skill you need to interview successfully. Arriving on the day without an understanding of the organisation doesn't look good, and you’ll likely find yourself ill-equipped to answer the questions that are put to you. Especially in today’s world, where the basic information you need is almost always easily accessible online, you risk the interviewer interpreting a lack of understanding as a lack of commitment. Employers want to see that you are genuinely interested in working for them, so be prepared for questions that gauge what you know about the organisation. As a baseline, get familiar with what the company does and the products and services it offers. Add to that an awareness of the history, key stakeholders and any other relevant information, such as recent developments in the industry, and you'll be well armed for your interview. The good news is that with company websites, social media and industry press publications, researching and preparing for an interview has never been easier. 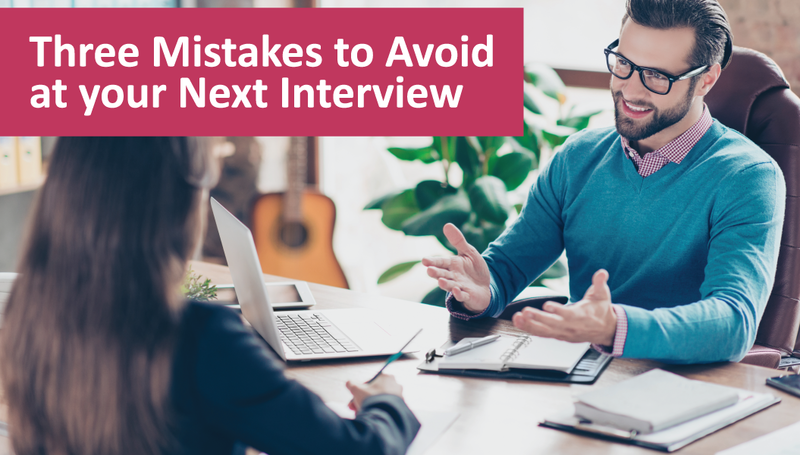 Another one of the biggest mistakes we see candidates make is not knowing the person who is interviewing them. Prior to the interview, it's likely that you will have had some level of correspondence with the interviewer, if only to set the interview up. As soon as you know their name, a quick search on LinkedIn or Google will help gain an insight into the person who they’ll be sitting opposite. It might only take a few minutes of your time, but chances are there will be plenty of useful information available. Details such as how long they've been at the company and what they were doing prior to that will not only offer insight into their professional background and personality but can also help to break the ice – maybe you both went to the same university or had similar roles in the past. In addition to this, if you’re working with a specialist recruitment agency, we’ll be able to help you prepare for upcoming interviews and provide insight into your interviewer as well. It may be tempting to read a few articles online and memorise seemingly 'perfect' answers to interview questions. The problem with this approach is that all too often, the interviewer has heard them before, and they know exactly where you got them from. Not only that, but it demonstrates a lack of thought, interest and originality. An experienced interviewer will be able to spot fabricated answers a mile away, which is why it's crucial to provide genuine answers that relate back to real experiences instead. When answering interview questions, reflect on your work experience and identify a number of examples that you can use. Think carefully over past achievements, positive feedback, successful projects and value added, and use this to stand out from the competition. On top of that, don’t be afraid to discuss previous mistakes and the lessons learned, as this demonstrates your ability to improve and grow professionally. No matter the level of your career, when it comes to interviews, the importance of preparation cannot be overstated. To give yourself the best chance of landing the job you want, put aside the time to research and prepare. Remember, the more insight you are equipped with, the better your answers will come across. For more advice on how to prepare for an interview or if you're looking for your next IT job, get in touch today – we're always happy to help.